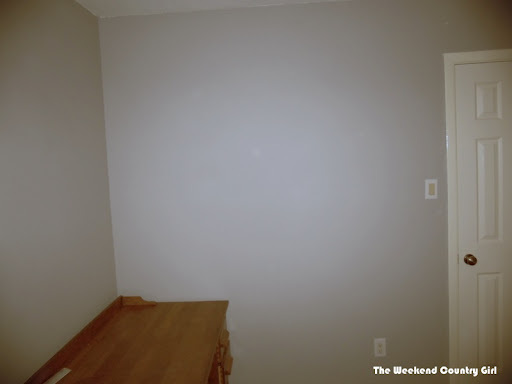 In the guest room I have a large empty wall over the desk that will be staying. The wall is the darkest in the room and it needs some sparkle and light. I will be making some art for the room, but I wanted to use some things that I already had around the house too. Recently I have had a mirror obsession. 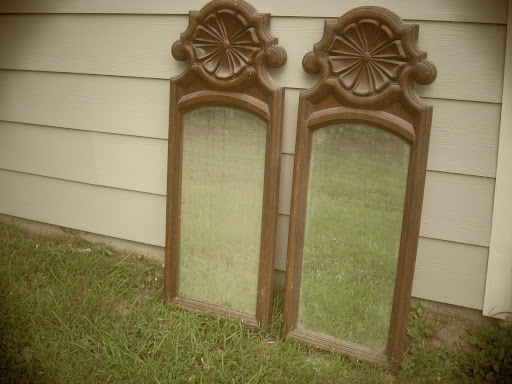 I have been buying the mirrors for $10.00 or less each- most are about $2.00. 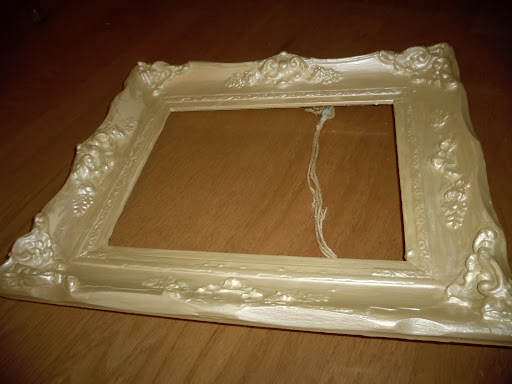 I also had a cool frame that I bought recently for $2.00 that I thought I would use for a chalkboard. Today while cleaning out a drawer I discovered a letter S that was hiding from me. I decided it needed to go on the wall in the center of the empty frame. I also had a bunch of vintage tarnished silver plated serving bowls and change holders. 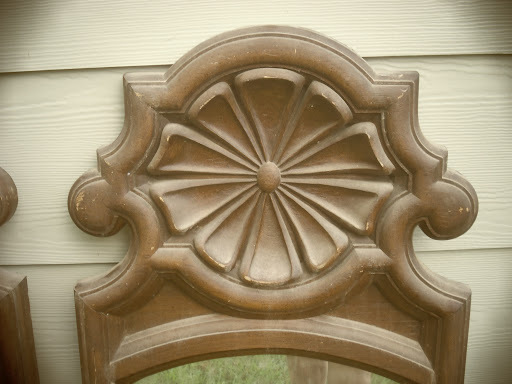 I found them on sale at Etsy for WAY more than what I paid See examples here.She’ll serving dishes I collected mine at resale shops in the country for 25 cents each. They have needed a home too. I laid everything out on the bed in about the size that the wall would be. 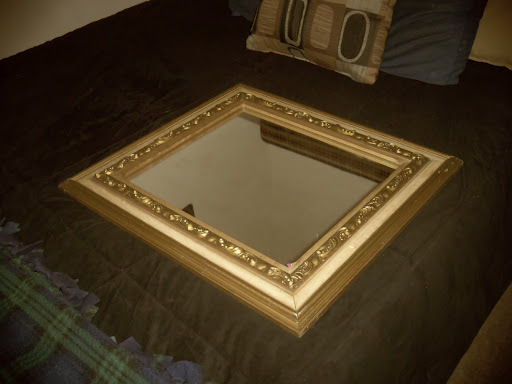 I will be painting the small square mirror black. 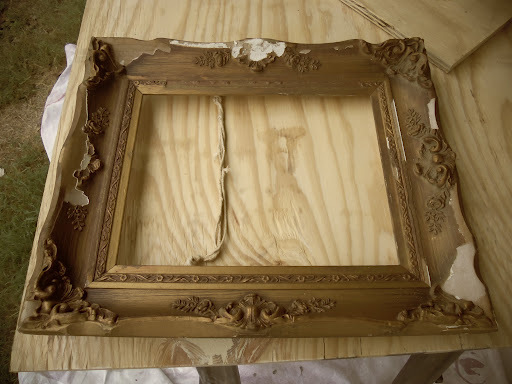 The empty frame was painted with yellow paint then three coats of the metallic paint that is on the stenciled wall. This is what it looked like when I bought it. Hubby brought in one of the mirrors I bought a while back while I was organizing . 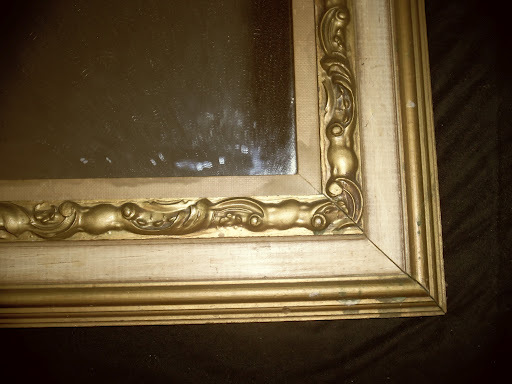 I painted the 70’s frame, used metallic silver and glaze on it a while back but Hubby just got the backs fixed and put the mirrors in for me when he saw the room. He said that the 70’s mirror belongs in this room. 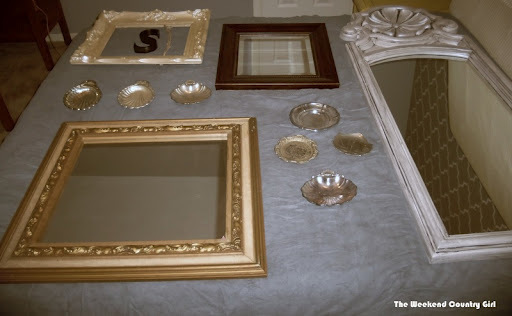 I still have one of the mirrors that I am ready to sell for Emma’s Hugs but he was right, one of them does belong in the guest room. 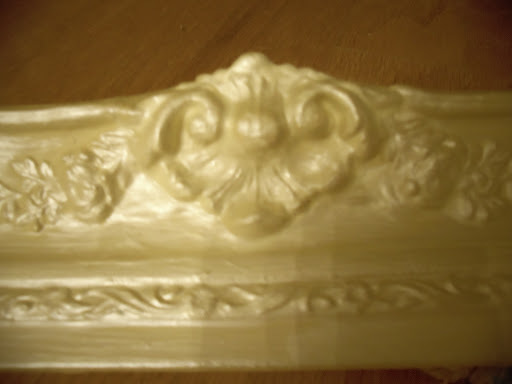 Click here if you want to see the frames redone. I need to go purchase some plate discs from Hobby Lobby before the silver pieces go up so it will be Wednesday night before I finish the wall. If you haven’t used plate discs you gotta try them. They hang anything that was not intended to hang on the wall easily. They are not cheap, about $1.50 each, but with my trusty coupons I should get them for 90 cents or so. Seems funny that the hanger will cost more than the art, but still just over a buck a piece is not too bad. I am leaving to see the Southern Belle Thursday evening so I must be finished or it will drive me crazy. I just read the link above. It is great when my IPad thinks it is smarter than me.